Warning: though this clip from tonight’s episode of The Exorcist is a dinner scene, you should absolutely not eat while you watch it. The scene shows the clandestinely demonic Cardinal Guillot (Torrey Hanson) and his various evil associates getting their just desserts... literally. Arya Stark would be proud. 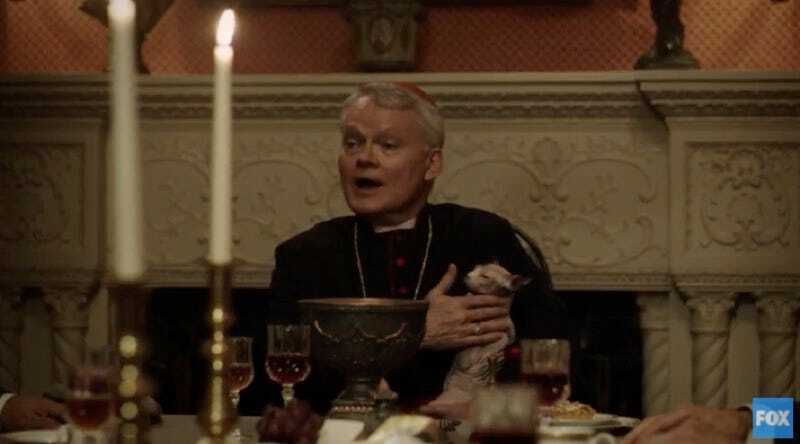 It also introduces us to new character Mouse (Zuleikha Robinson), who was described when she was added to the show as “a mysterious figure waging her own private war against the Catholic patriarchy.” Based on the fact that we saw the Cardinal at the Vatican last week, making a fool out of Father Bennett (Kurt Egyiawan), it seems likely that Mouse—whose name certainly doesn’t match her ruthlessness, nor her apparent affection for cats—will meet up with Bennett in Rome sooner than later. We haven’t seen too much of The Exorcist’s European storyline yet, so this is an especially juicy sneak peek, in more ways than one. The Exorcist airs tonight on Fox.